To get the best out of you mug, and to guarantee mugs being leak proof, please follow instructions on leaflet in your mug, as well as tips in follow up emails! PleasTorch lid is dishwash safe. The body of the pink mug HANDWASH ONLY. The body of the SILVER mug is okay in dishwasher. As a special THANK YOU from us for telling your friends about your new snazzy travel mug, we’ve included a 25% OFF next purchase voucher in your order. You’ll find it inside your travel mug! GUARANTEED LEAK-PROOF (unlike most others under £20 who claim to but just aren’t). Are you frustrated trying mug after mug? 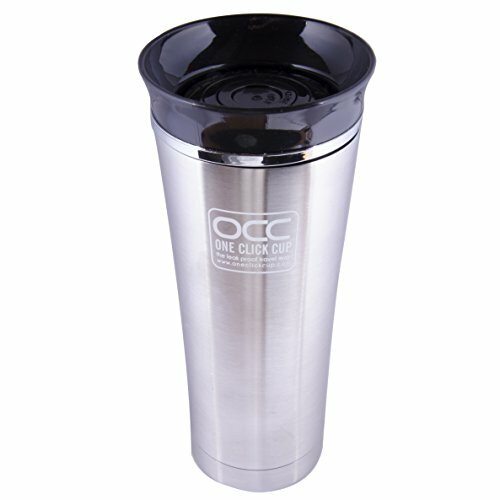 We’ve tested over 50 travel mugs so you don’t have to! This one is … simply the best! Perfect hybrid between thermo flask and travel-mug. Create dependable, precious moments of relaxation and calm during stressful or unpredictable days. INNOVATIVE DESIGN, 360 degree lid, means you can drink from any angle. No more fumbling around to align your flask when you mind is focused on more important things. Easy and convenient one click open and close, one handed operation. Fits most standard car cup holder (read the ‘Product Description’ section below for base dimensions). Dishwasher safe. 100% BPA free. BUY 3 FOR THE PRICE OF 2. Buy 3, pay only for 2. Great offer, limited time only. Buy additional ones for family, or club together with work colleagues. They will THANK YOU for it. Any combination of Silver or Pink. Change quantity to 3, and enter code OCC1FREE at checkout.